©Neil Turner, November 2014. 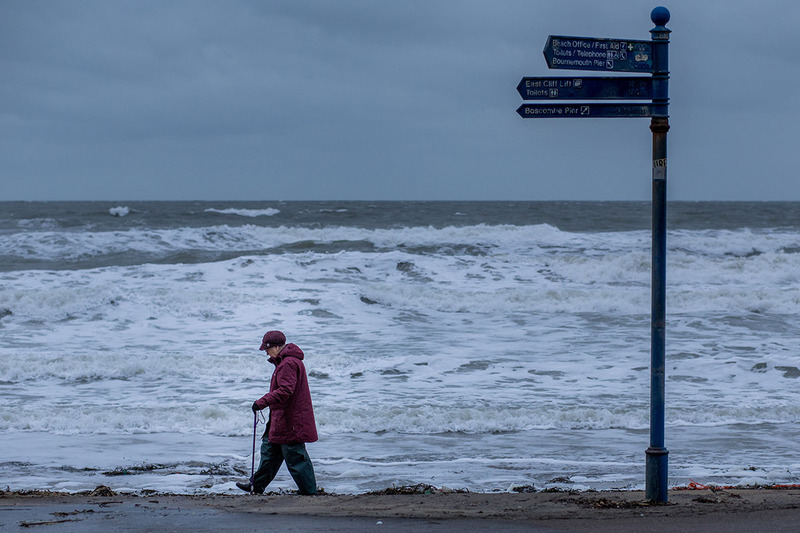 A pensioner walks along the beach near Bournemouth Pier. Following on from my post about zoom and prime lenses I was out with just the primes yesterday – walking along one of my favourite bits of beach in wild winds and failing light. I was just out having some photographic time before getting into the car for yet another drive up the M3 for work. This one was shot at 640 ISO at 1/1000th of a second at f4 with an 85mm f1.8 Canon EF lens on my rather lovely little Canon EOS6D – a camera that I am becoming increasingly fond of. When I’m doing personal work like this I tend to set the white balance to daylight and accept whatever colour cast I get and in this case it wasn’t far off of what the naked eye saw. Lovely shot. I like the stick and the pointing leg and foot echoing the signpost.